Most of the speculation is about Premier League’s brightest star, Andrey Arshavin. The Euro 2008 hero was going to leave his club, Zenit Saint Petersburg, during the summer break, but neither Barcelona nor Tottenham Hotspur could afford to pay the € 27 million transfer fee. But the player is sure to change team in the winter as he’s said that he won’t play for Zenit ever again. 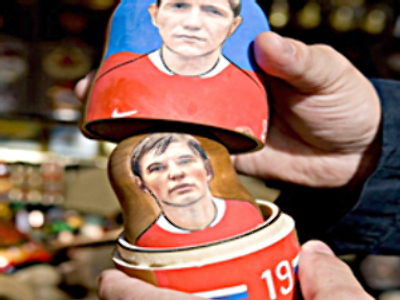 The favourite to grab Arshavin is now Real Madrid. The Spanish superclub wants to take the 27-year-old on loan with the possibility of buying his transfer for $US 37 million later. However, in an interview with German tabloid, Bild, on Monday the Russian striker said that playing for Bayern Munich is a dream for any player, including himself. The decision on Arshavin’s fate won’t be made till December 10, when Zenit will play their final match in the Champions League group stage. Winger Yury Zhirkov is one of league’s best and most consistent players. He joined CSKA back in 2004 and seems satisfied with his position in the club. But there are rumours that Italian super club Juventus wants to buy the player as well as Zenit St. Petersburg, who need replacements for their departing stars. CSKA’s Wagner Love, who has scored 20 times in just 26 Premier League games, has also announced that if he gets the right offer, he could be on his way to a big European club in the January transfer window. Earlier, Spanish side Athletico Madrid expressed their desire to see the Brazilian international in its squad. The Ukrainian international, Anatoly Tymoschuk, has declined the offer to prolong his contract with Zenit for three more years. It is most likely that one of the league’s best defensive midfielders will start the next season playing for German Bundesliga giants Bayern Munich. The UEFA Cup’s top scorer in 2007/08, Pavel Pogrebnyak, also has not signed a new contract with Zenit. The negotiations continue but the striker says he has some interesting offers from Spain and England. He’s just 18 years old but both Real Madrid and Barcelona are already watching his every move on the pitch. Another CSKA player, Alan Dzagoev, put in some great performances in the Russian league and UEFA cup and has already made his debut in the national team in a crucial away game with Germany. One of Guus Hiddink’s favourite players, Igor Semshov, helped Dinamo Moscow claim the bronze medals this year, but he may start the next season in another team. According to his contract, Dinamo would have to let the player go if somebody offers € 8 million for him. Champions Rubin Kazan and Spartak Moscow seem eager to pay the sum. Arshavin heading for Real Madrid?